The Extraterritorial Imunity of The Imperium of Diamond's federal government. Today, a visit to the European house in Vienna, Wipllingerstraße 35, confirmation of the transfer document to a contact system for communication with the European Commission, the European Union, the European Council, the European Parliament, the European banks, and particularly with European security structures. The document was passed. In the case of my first attempts at handing over documents and communications in 2011, concierge service launch strategy lies that local seat is not designed for the transmission of communications and there is no possibility to take over the document. The service reception is in the final version of excuses on the team © Securitas, therefore, that the European Union has lost political criminal liability. Funny case. Other documents were in the same year, followed receipt without major conflicts and excuses, because the documents were related to the United Nations, fear of International criminal resdponsibility. Small maneuvers on reception subsequently summoned to Mr. Mag. Bernard Kuhl and his office. Mr. Kuhl presented that he does not understand the document in the interests of the designated address, the document may be possibly thrown away in the trash......false. EU is responsible for their workers. After consultation and notification about the document and its relatedness to international law, and hence the resultant obligations to act responsibility of European policy, that the document is received and stamped. The first stamp was owned by a named Bernard Kuhl, without regard to political institutions. That's why I asked for the following second stamp of the European institutions. Stamp are passed, and together with the date of day written be pen. When handing over the document was also handed over documents for registration of temporary identification. Document form, confirmation about righth of the WD Sovereignty. Diamond Oasis, projects for the development of civilization on the minimum level of 10 million people. Entry is open to all migrants and refugees. But the problem is, European terrorist oposition have stabile cooperation and defend of their terrorism, and without any respect of Alliances for International Rights, therefore why the United States supports European terrorist crimes stability and coverage that surpass the worst criminal acts of humanity. Diamond Oasis and main principles of the UN Charter, support for developing countries, peacekeeping principles. Why the US government would prefer not support the common market and the emergence of a MC Donald. MC Donald in the territory of Diamond Oasis (the ability of water resources, agriculture and construction as the basic fact), and immediately the population fully active and benefit from high budgets migrants (Removal from the local refugee routes Libya, Syria, Iraq, Palestine, Africa, anywhere in the world IDS support to deport), open for ten million. Today, for the past five years, over 60 million had to flee their homes, many people fled to Europe, a place full of hatred and racism, media intrigue and political resistance, in all cases, the true form against the opposite Diamond Oasis. In African, Asian, American and also in European countries live in small children who must be starving. Small children who grow up in the desert and her body standard die in the cities on the sidewalk. 20 million young children die every single year. Diamond Oasis is the ability to provide good health and life for each of them. Diamond Oasis opened to 10 million people, and the ability to develop population and states on other planets in the universe. US supports terrorism in Europe, the USA is also responsible for the largest refugee and migration crisis for this period of humanity. Just as the USA responsible for the crimes of terrorists and Europe. I do not like those countries that are unable to recognize their responsibility. Today, I really thank everyone who supports our friendship and so exercises its option to deportation of refugees and migrants into the territory of Diamond Oasis, even with a basic civilizational support as a basis for a common market. Our cooperation will follow the values ​​really rich recompense for your support. 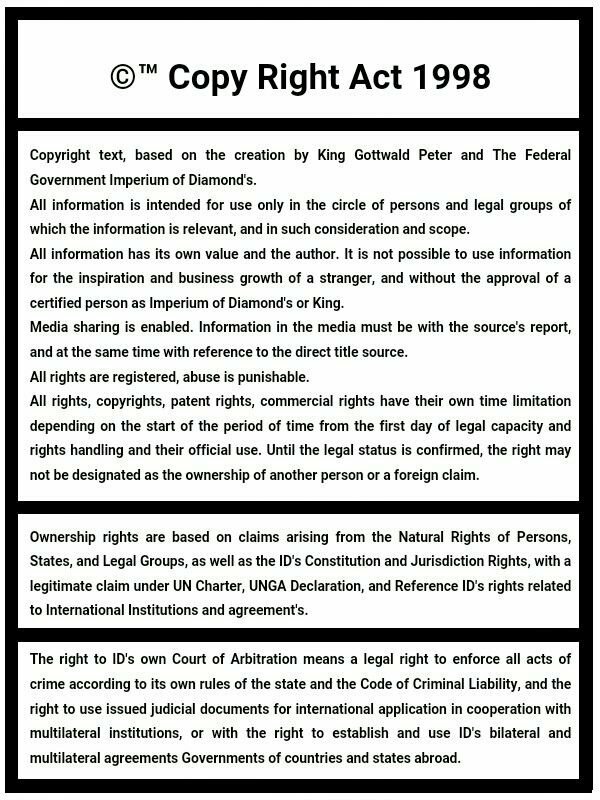 The ID's Stabile Function of Colony in territory of The Diamond Oasis, and Legal Agreement with certification about Safety & Legal Function. Second, other Right's will be present in Document about Certification of citizenship. Extraterritoriality according rules for citizenship.